In Pétanque the objective is to score points by having boules closer to the target than your opponent after all boules have been thrown. 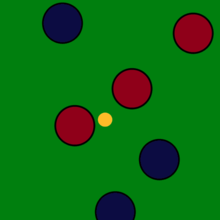 This is achieved by projecting boules closer to the target, called a cochonnet, or by hitting the opponents' boules away from the target, while standing inside a circle with both feet on the ground. Pétanque is not currently an Olympic sport, although the Confédération Mondiale des Sports de Boules—which was created in 1985 by several international boules organizations specifically for this purpose—has been lobbying the Olympic committee since 1985 to make it part of the summer Olympics. 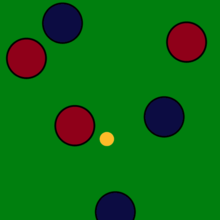 Leisure boules are boules that do not meet the FIPJP standards for competition boules, but are less expensive than competition boules and completely adequate for "backyard" games. Unlike competition boules, leisure boules are a "one size fits all" affair—they come in one weight and size. The jack, or target ball, is a small ball made of wood, traditionally boxwood or beechwood, 30 mm (1.2 in) in diameter. In the past jacks were often left "natural"—unfinished or with a clear finish—but nowadays they are often painted in bright colors. In French, the jack is known by a variety of names, including but (goal or target), cochonnet (piglet), bouchon ("little ball" in provençal language, not related to the french word "bouchon" that designates a bottle stopper), le petit (the little one), and gari ("rat", also in provençal language). In the United States, proponents of pétanque such as author Byron Putman often urge the use of non-dedicated public terrains—public walking paths, playground areas, dirt/gravel parking lots, and baseball infields – as terrains. 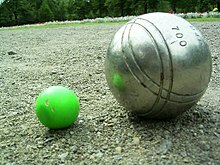 ^ "Terminology – Origin of the word pétanque". 21 September 2014. ^ Okamba, Louis; Imray, Gerald. "All Africa Games return to roots in Republic of Congo". Times Union. Associated Press. Retrieved 6 September 2015. ^ Les Championnats du Monde de Pétanque Archived 2012-12-15 at the Wayback Machine at the FIPJP web site. ^ History of the FIPJP Archived 2012-08-10 at the Wayback Machine at the FIPJP web site. ^ "CMSB". 7 October 2014. This page was last edited on 23 February 2019, at 22:28 (UTC).